This year, we will once again be at the Idlewild Country Club, located at 19201 Dixie Highway in Flossmoor, Illinois. Idlewild Country Club is a private country club nestled in secluded surroundings twenty-five miles south of Chicago. Their 18-hole, par 72 championship golf course offers beauty and challenge to players of all skill levels. Lunch and registration begins at 10:00 a.m. Shotgun start at 11:30 a.m. Listed below are sponsorship levels which will bring Representative Riley closer to his fundraising goal. Diamond Sponsor $2,500 – Recognition on all golf signs and materials (both printed and digital). Company logo on banner and advertisement at tee. Includes two foursomes. Platinum Sponsor $1,500 – Recognition on all golf outing signs and materials (both printed and digital). Company logo on banner and advertisement on tee. Includes one foursome. Gold Sponsor $1,000 – Recognition on all golf outing signs and materials (both printed and digital). Company logo on banner and advertisement on tee. Includes one twosome. Dinner Sponsor $500 – Recognition on digital media. Includes four dinner tickets. Lunch Sponsor $500 – Recognition on digital media. Includes two dinner tickets. Hole Sponsor $250 – Includes one hole sponsor sign and recognition on digital media with one dinner ticket. Beverage Sponsor $250 – Recognition on digital media. Two dinner tickets. Raffle Prize Sponsor $100 – Recognition on digital media. We appreciate your consideration to support this fun and worthwhile event. 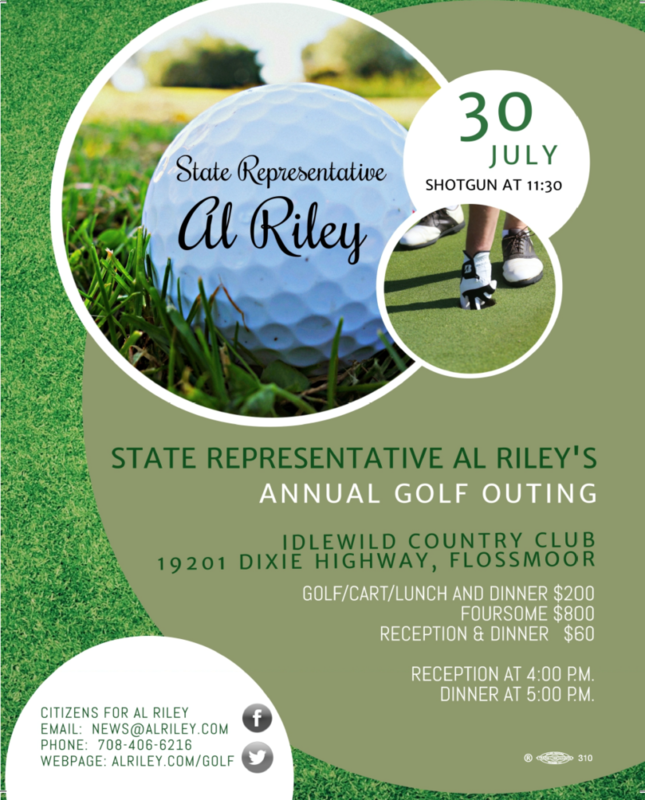 Thank you in advance and we look forward to seeing you at Representative Al Riley’s Annual Golf Outing. Please do not hesitate to call us at (708) 406-6216 or email us at news@alriley.com with any questions. Checks can be made out to Citizens For Al Riley (CFAR) and mailed to P.O. Box 282, Olympia Fields, IL 60461. We look forward to a wonderful summer afternoon to support State Representative Al Riley. Please fill out the form below if you would like to register online for Representative Riley’s Annual Golf Outing.